Dalstrong V3 edge technology: Our special convex edge grinding process delivers exceptionally less surface resistance and a ruthlessly razor sharp edge. You need to try it to believe it. The Dalstrong Difference: Ultra sharp, will never rust, absorb oils, odors, acids, or salts. Impervious to chemical leakage, spectacularly light, with a perfectly engineered balance and 15x the edge retainment of steel. Specialized Blackened Ceramic Knives: Made from a proprietary blend of the highest quality zirconia and forged utilizing state of the art Cold Isostatic Pressing process (CIP) before being super heated, our blades are sharper, harder, stronger, lighter, and more beautiful. 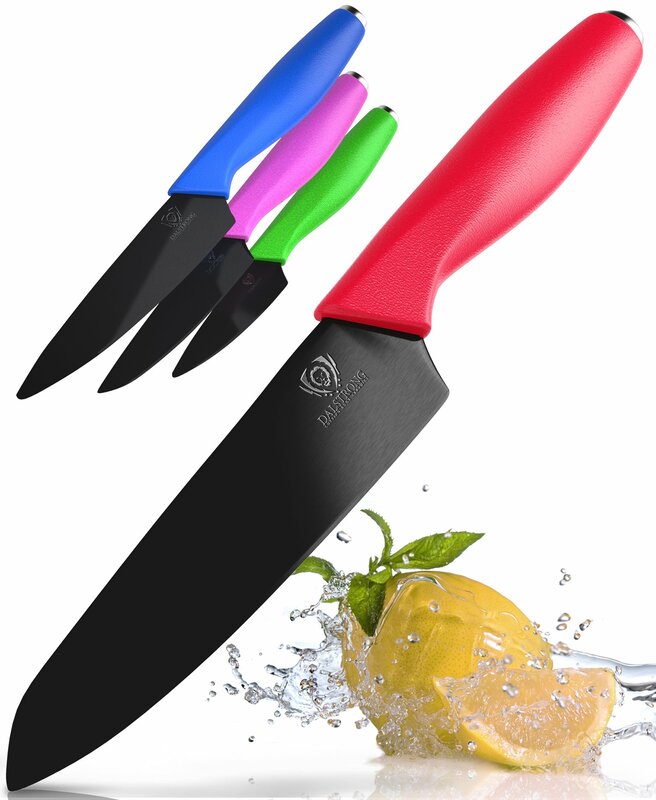 Color Coded: Select the correct knife from the drawer with a simple glance, the Spectral Blades ceramic knives are color coded for your convenience and include matching BPA free PerfectFit sheaths. Chef knife, paring knife, utility knife and slicing knife. Red, blue, green, pink. Dalstrong Trust: Our premiere ceramic knife collection set and luxury packaging make for an ideal gift - Birthday, wedding, anniversary, mom, dad, wife, husband, and those who cook in your life. We stand behind our knives and customers with a 100% SATISFACTION OR MONEY BACK GUARANTEE, try it risk free, we know you'll love them!